For years I’ve had my eyes on an evening Iberia A340-600 flight that operates from London Heathrow to Madrid. Last month, I finally had the chance to fly it. With a same-day flight necessary from London to Madrid and prices sky high, spending 12,750 Avios plus $66.13 for a lie-flat bed made the most sense. After 11hrs without internet on Biman, I maximized my time in the T5 British Airways lounge and arrived toward the end of the boarding process. The A340-600 is a huge aircraft. Iberia fits 46 business class seats and 300 economy class seats onboard, with premium economy coming. Business Class is arranged in a staggered 1-2-1 configuration with 12 rows. Due to my last-minute booking, I was seated in the last row though it worked out well because I had the whole row to myself. Boarding late rather than early, I missed out on a pre-departure beverage. FAs were distributing menus as I boarded, but ran out a couple aisles ahead of me and never returned. No amenity kits on this shorthaul flight. 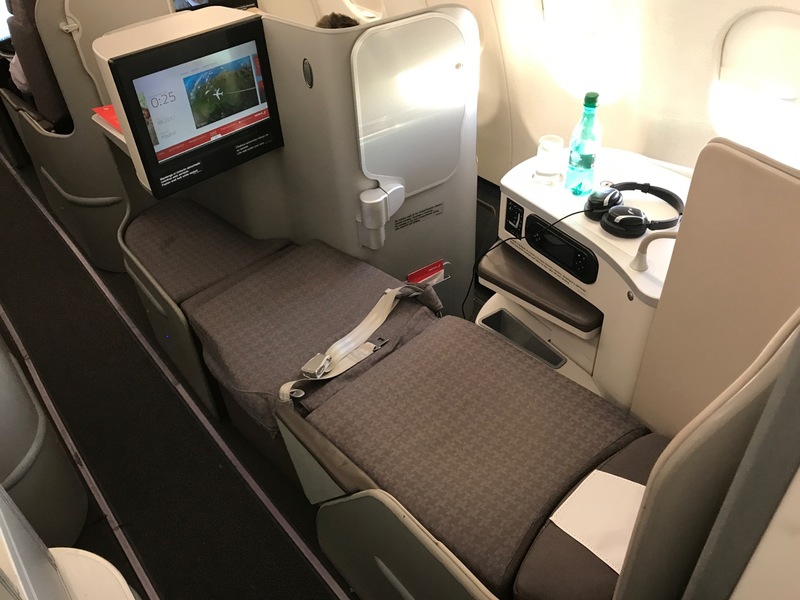 The Iberia business class seat receives a lot of complaints, but I don’t mind the seat at all. While not as nice as a reverse herringbone seat, I found the seat comfortable in the upright, semi-reclined, and lie-flat mode. As you can see, there is not a lot of privacy, but without an enclosed footwell your feet do not feel constrained in the lie-flat mode. Personal storage is very limited. The cubby hole barely could hold my laptop and the three small compartments around the seat were not good for much. There is no literature rack/pouch to hold in-flgiht magazines, so the magazine and duty free catalog were just sitting on the seat. A USB port and universal electrical outlet were available. Business class passengers received a 4MB voucher good for Wi-Fi. I thought that was a joke until I looked at the pricing card. Wi-Fi prices are ridiculous — the highest I ever seen. I complain about similar pricing on a transcon or longhaul flight but on Iberia, $34.95 only gets you 45MB! Service began with a beverage after takeoff. No mixed nuts or olives. The meal arrived wrapped in plastic and foil, a shame the FA who so graciously found me a steak did not take an extra moment to unwrap the meal for me and other passengers. It appears that Iberia ran out of “toffee delight” dessert as well, since I received a packaged cake slice that appeared to be from economy class. After dinner, coffee tea and were offered. Unfortunately, no espressos or cappuccinos were available so I had tea. The full IFE system was turned on for the 2.5hr flight to Madrid. Choices included a number of box-set TV programs, movies, games, and music. The layout of the IFE system was very easy to use and aesthetically pleasing. Unfortunately, the noise-cancelling headphones were the type that hurt your ears after wearing them for more than a few minutes. Only a thin wool blanket and small pillow are used on shorthaul business class flights. My flight from Madrid to Los Angeles the following day included much better bedding. With a lie-flat bed and medium-rare steak dinner on a 2.5 hour flight, it is tough not to leave impressed. Honestly, I have no real complaints about the Iberia product. In fact, I’d even go out of your way to fly it if you have the chance. Remember, award space is now bookable online at aa.com. Next Article Who Are The Stewarts? hm, you were seated in the last row at the window and say the personal storage space is limited?? For a 2.5 hour flight, this is all anyone could ask for! In addition…WOW that steak was beautiful. But for a longhaul flight…that aisle seat is superrrr exposed. No privacy by the head, and your feet could easily go in to the aisle. As a *G person, I probably wouldn’t ever take Iberia, but nice to know!